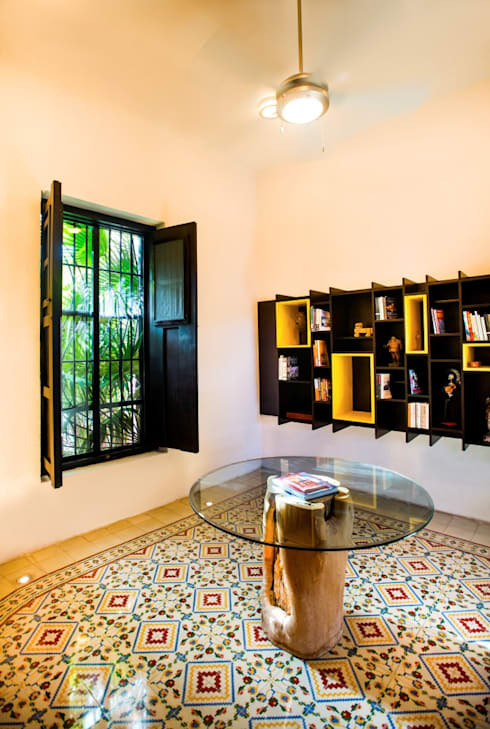 Today on homify we are visiting a colourful and freshly designed house in Merida, Yucatan. The house is a living SH63 proposal that integrates stylish external elements, along with beautiful interior spaces. These domestic areas are enhanced using a combination of colour, texture and transparency. All of these elements create a characterful and contemporary architecturally designed Mexican dwelling. 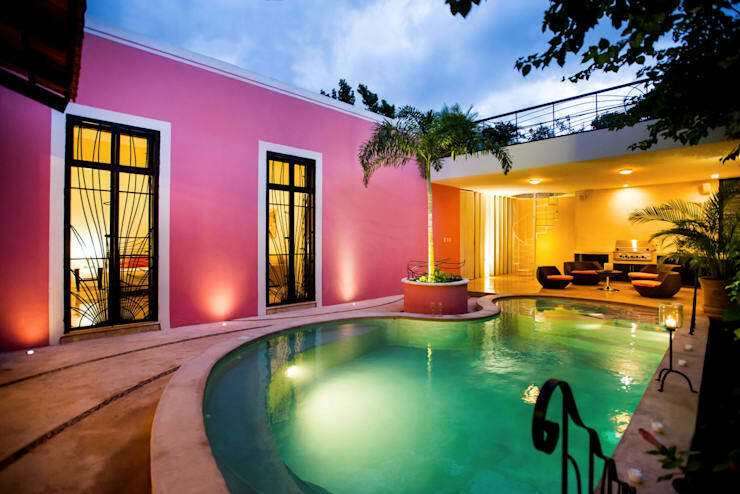 The main façade is a combination of a deep pink hue, and is accompanied by colourful, lush vegetation. Visible on either side of the front entrance, this dwelling invites the visitor to discover this stunning interior. 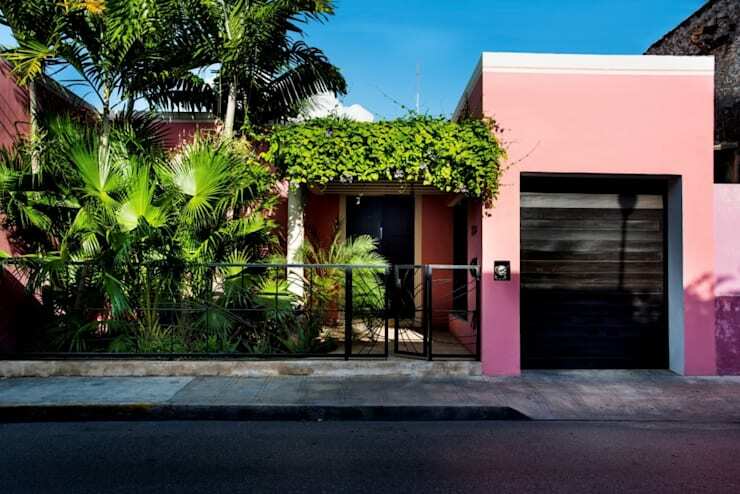 Discreet in its form, this home employs simple pink cubes along with black metal gates, and yet the residence feels mysteriously inviting. A wrought iron fence and gate feature an image of the sun, which is again repeated in various interior spaces. It is extremely evident that the sun's rays were a great inspiration for this architectural creation! The home's lobby is a large, light-filled space featuring an ambience evoking clarity. Neutral wall colours allow the contrasting bookshelf to shine as a standout focal point within the room. Furthermore, the colourful yellow patterns encased within this bespoke design match beautifully with the traditional tiled floor design. This room creates a visual harmony that provides a warm welcome to all who enter, as well as a bright and warm promise of more surprises. The social living area shares space, and integrates with a bright blue courtyard. This small garden is located in the centre of the building, and serves as a connection to the other areas of the dwelling. Additionally, this courtyard functions as a lightwell, offering natural illumination and ventilation. Furthermore, those spending a little time outside will notice how the garden filters sound through the abundant vegetation, providing a comfortable interior. Moving inside, the living area is delineated by a floor mat, which is a pastiche of blue hues. The furniture is off-white, as are the walls and ceilings, which is perfect for reflecting light. The stylishly neutral interior ensures the exterior courtyard is a focal point, and yet avoids taking a backseat, instead looking striking and comfortable. Some of the most memorable features of this room include: the blue dining chairs, blue garden wall art, and lush greenery. This is truly a space that refreshes and nourishes anyone who is lucky enough to enter! 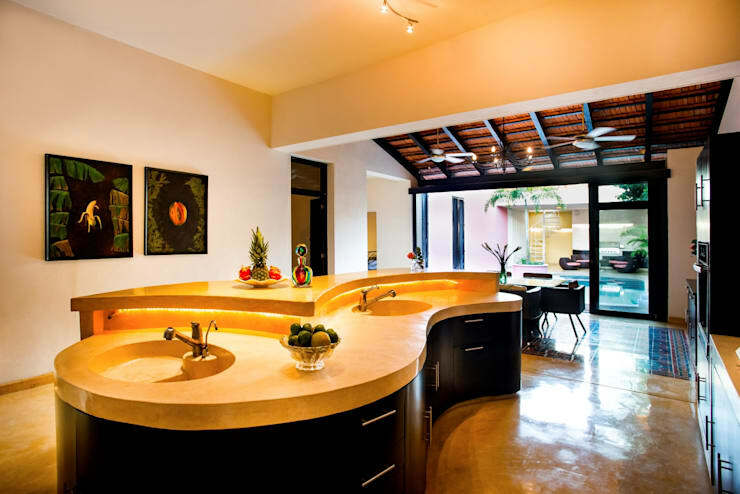 The kitchen features a sinuous shape and form, which includes a centre island of organically polished white concrete. When illuminated from the above lights, the worktop emerges with a golden yellow hue. The timber joinery is designed in an exquisite chocolate shade, and the flooring is manufactured from exposed concrete. Offering a smooth and glossy finish, the counter's brightness reflects the yellow hues onto the ceiling, and then back to the floor. This creates an atmosphere of sunlight, with golden glows and warmth. Exuding a sense of being outside, this light-filled space is the ideal space to be enjoying a delicious family meal. If you are considering a bespoke kitchen, chat to a professional, and get a unique and intriguing design! 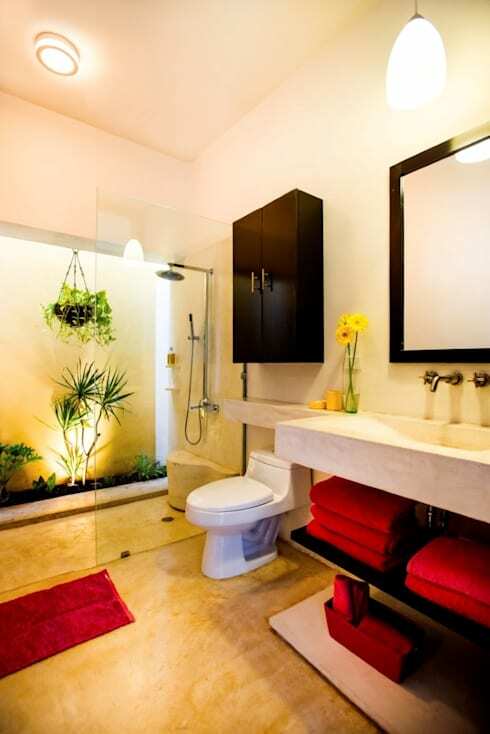 The bathroom is a spectacular room, which is full of comfort, and the perfect place for a relaxing moment alone. Featuring an interior garden with vegetation bathed in natural light, this area is a naturally lit space that offers a sense of clarity and calm. The reflective nature of the room's colours and textures ensure shine is reflected from the polished surfaces, evoking an atmosphere of peace. The decorative elements and details on the rug and towel are a deep red colour, which breaks the monochrome cream hue, and ensures an elegant and harmonious bathroom. We next enter the surprising guest bedroom that is delineated by the blue patio. 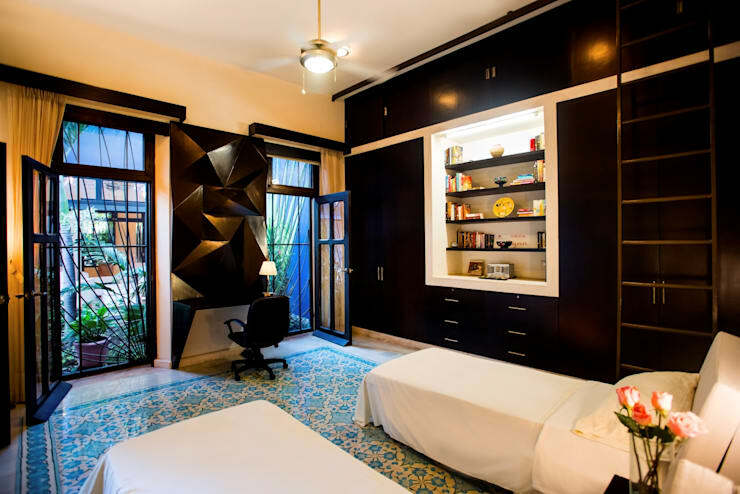 The room features a carpet of blue patterns, while the woodwork is in chocolate shade that dominates the room. The wardrobe is a spacious timber in a dark hue that frames a bookshelf and illuminates a discreet display of decorative elements. The desktop, meanwhile, breaks the monotony of the angular forms and appears to extend over the wall and into a collection of geometric shapes, corners and angles that reflect glare and mysterious lights, thus creating movement within the room. One gorgeous feature of the house is the bright white colour upon the walls and ceilings, as well as the polished concrete floor. This flooring has designs that resemble a stylish pattern, and look as sumptuous as if the floor were embroidered fabric. Each space is dotted with vivid colours thanks to the reflections around the room. The wrought iron bed features an attention-grabbing sun, which reappears in the privacy of the master bedroom, excelling as a central element of the comprehensive and inspiring design. The basement, originally used as a tank, has been transformed into a wine cellar. The dim, warm, and mysterious lighting creates a romantic space, with the sun shape again acting as a gorgeous element. 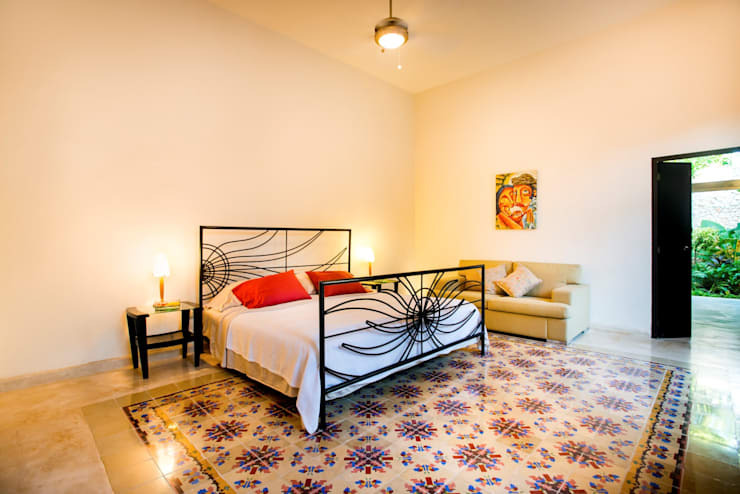 The floor is polished concrete, with terracotta inking that ensures a gorgeous earthy ambience. The block lattice points in different directions and incorporates new sections that are a delicate in their detail, with bright illuminated openings. This space is perfectly sublime: captivating, with a sense of romance. As if there were not enough surprises within this house, we exit the property and discover the a superb swimming pool! Without a doubt, the true heart of this home is here. This is an area where people live, play, and enjoy a relaxing time beside their loved ones or alone. This is indeed a space to be enjoyed. The final courtyard has a delightful pool in a turquoise hue, along with an exquisite terrace, foliage, and natural illumination. This lighting is wonderfully integrated with the interior rooms through glazed gates, replete with the iron shaped sun. A treat in every possible way, this is the perfect to end a day and enjoy the sunset. 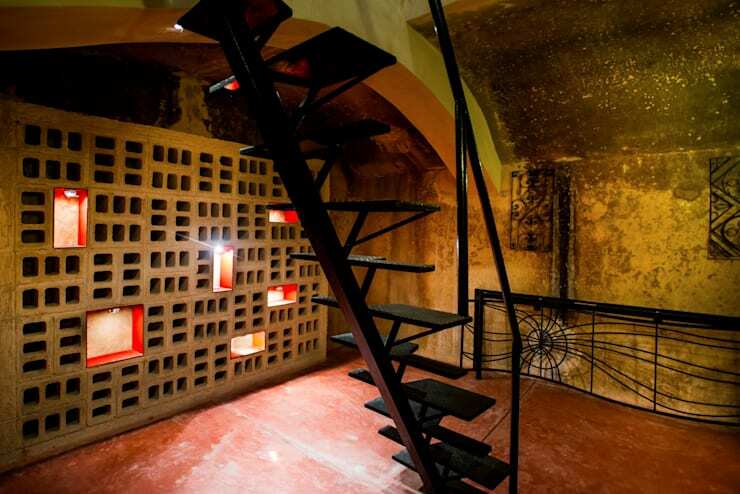 This is but a small sample of what the experts at Taller Estilo Arquitectura, Yucatan, are able to create. 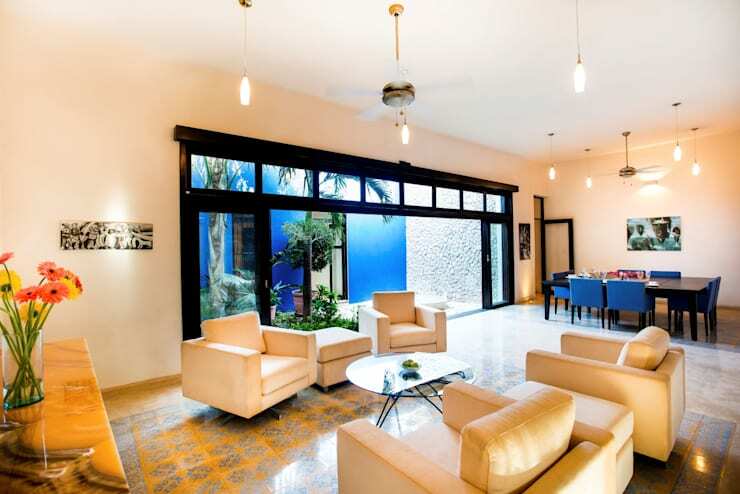 This home is the epitome of stunning contemporary Mexican architecture, true to the culture, tastes, beliefs and habits of the citizens. This home is full of colour, brightness, natural light, freshness, fun, and of course life! Did you enjoy the flamboyancy of this home? Let us know your thoughts in the comments section, below!